Twitter’s advertisers will be excited to hear that their ads are about to get more eyeballs. The social network’s Promoted Accounts on Monday will begin showing up in mobile users’ timelines. Promoted Accounts have been around for more than three years, but were relegated to the lefthand sidebar on Twitter’s desktop website. Unlike Sponsored Tweets, brands paid Twitter to recommend them in the “who to follow” column. The accounts weren’t completely random. Twitter used information about who you followed to recommend Promoted Accounts to you. If you follow a lot of tech companies, for instance, Twitter might encourage you to follow Microsoft—if they pay for the privilege, of course. Advertisers can offer geotargeted calls-to-action to make their accounts more appealing. So what’s new? Well, now you’ll see those accounts in your mobile timeline, where you didn’t before. Also, advertisers will be able to add a geotargeted call-to-action message to entice you into following them. This will affect the 76 percent of Twitter users who access the site from their smartphones—including those who live overseas. If Twitter leveraged Nearby, a still-incubating function that surfaces hyperlocal tweets based on where you’re tweeting from, to serve up Promoted Accounts—perhaps with calls to action that offered deals or discounts—users might be more receptive. It’s unclear how angry people will be when they spot these new intruders in their Timelines, but one thing is certain: Advertisers are surely smiling. That’s good news for Twitter, which has some money to make now that it’s a public company with shareholders to satisfy. It’s worth noting that Twitter only makes money if users click on Promoted Accounts—the same applies to Sponsored Tweets—so making those ads as engaging as possible is the social network’s M.O. 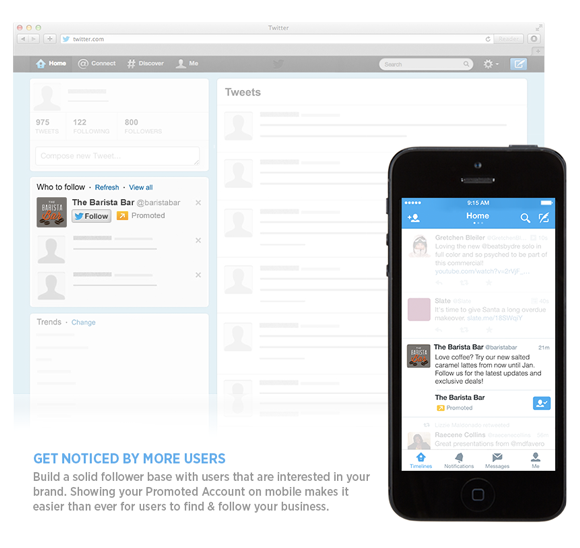 This story, "Promoted Accounts land in mobile Twitter timelines " was originally published by TechHive.